You asked…we answered! Sea Turtle Camp, in partnership with WB Surf Camp, is excited to announce the kickoff to our newest summer camp program, Carolina Ocean Odyssey. 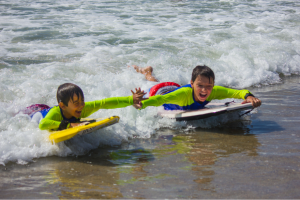 This 6-day residential camp is designed specifically for younger ocean enthusiasts, ages 10-12. Coastal North Carolina offers a unique setting for this hands-on, aquatic adventure. Carolina Ocean Odyssey is geared toward students who are excited about the ocean and exploring the marine environment. From salt marsh exploration to surf lessons and paddleboarding, there is an ocean of fun to enjoy. Carolina Ocean Odyssey participants will be housed at the Salt and Light Center on beautiful Topsail Island. Located just steps away from the beach, campers will wake up each day to the sound of the waves crashing. These fully furnished, ocean view rooms are air-conditioned and each bunk room has its own bathroom and has 24-hour same gender adult supervision. Campers will enjoy dining together in our dining hall and will enjoy onsite campfires and outdoor activities. This beachfront retreat is the perfect location for this ocean adventure.